M1000, M2000 & M3000 compact manual laser workstations from FOBA. FOBA M1000 has been designed for the high-quality laser marking of small parts, medium sized components and work pieces and batches. It's ideally suited for laser-aided processings in the autoparts industry, tools and metal industries and machines construction. FOBA M2000 for automobile and autoparts industry, tool and mold construction, machinery construction, medical technology and plastic processing industries. The M2000-B laser marking machine is equipped with a programmable Z-axis, a work table and an electric lift door - general-purpose marking machine for marking various single parts (including large ones) in many sectors, including the automobile industry. 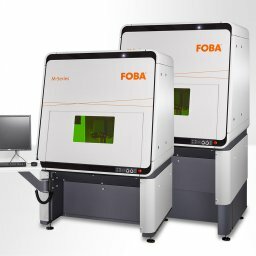 FOBA M3000 advanced laser marking workstations for reliability and the economic marking and processing of large components. The M3000-B laser marking machine is equipped with a programmable Z-axis, a work table and an electric lift door. An all-purpose laser workstation, particularly useful for marking large single parts in many sectors. The M3000-R automatic rotary table workstation is equipped with a motor-adjustable Z-axis and a 2-station rotary table. Well suited for producing serial parts found in day/night design elements. The M3000-P laser workstation is equipped with three progrannable axes (X, Y, Z; can be expanded to 5 axes) and an electric lift door - ideally suited for the processing of batches and small parts in pallets and trays. For more information on the M-Series see FOBA M-Series Laser Marking Workstations. For information on other FOBA laser marking machines see FOBA Laser Marking Machines.